If you have located _ENCRYPTED_BY.WHITEROSE appended to almost all your files and they have been renamed, Whiterose Ransomware must have infiltrated your computer and locked your files. It was confirmed during research that this ransomware infection is a new threat, but there is one feature it shares with all other ransomware infections – its only purpose is to extract money from users. Do not send a cent to malicious software developers behind this infection even if it has encrypted all your important files because transferring money to cyber criminals does not necessarily mean that files will be unlocked and you could access them again. Therefore, you should not even consider sending money to crooks in exchange for the decryption tool. Instead, find an alternative way to restore your files after deleting this infection completely. As has been observed, it removes its executable file after encrypting files on victims’ computers, which means that you will need to erase only one component to get rid of it – a ransom note it drops on affected computers. It should be emphasized that there is a bunch of more sophisticated threats out there on the web waiting for an opportunity to slither onto users’ computers unnoticed, so keeping the system unprotected is the worst users can do. You will surely find your files locked if Whiterose Ransomware ever slithers onto your computer. This infection will lock almost all your files, including all your media files, but it should not encrypt any files in Windows, Program Files, Microsoft, and $Recycle.Bin directories. This is good news because it means that your computer will keep working normally. The ransomware infection drops a ransom note HOW-TO-RECOVERY-FILES.txt after encrypting all the most valuable files. Users soon find out what they need to do to get their files back if they read it. They are, first, instructed to download qTox from the source indicated in the ransom note and install it on the system. Then, they need to contact cyber criminals and send them the personal key with one encrypted file. You will get it decrypted if you send it, but you should not pay for the decryption of other files that have been locked because they might stay as they are after you send money to malicious software developers behind it. Yes, we believe that you might not get the decryptor after making a payment, which is why we suggest keeping the money to yourself. We cannot promise that all these locked files could be unlocked easily in a different way. To tell you the truth, it is very likely that the only free way to get those files back is to restore them from a backup. It has been observed that Whiterose Ransomware deletes Shadow Copies of files and disables Windows Recovery, which is why restoring files from a backup is the only free way to get them back. It is still not easy to speak about the distribution of Whiterose Ransomware because this malicious application has not affected many computers yet. Consequently, it is hard to make any conclusions about its distribution. Of course, there is still no doubt that this infection enters computers illegally. According to specialists working at pcthreat.com, it is very likely that this ransomware infection is spread via malicious emails, so ignore all emails you find suspicious, especially if they have attachments. 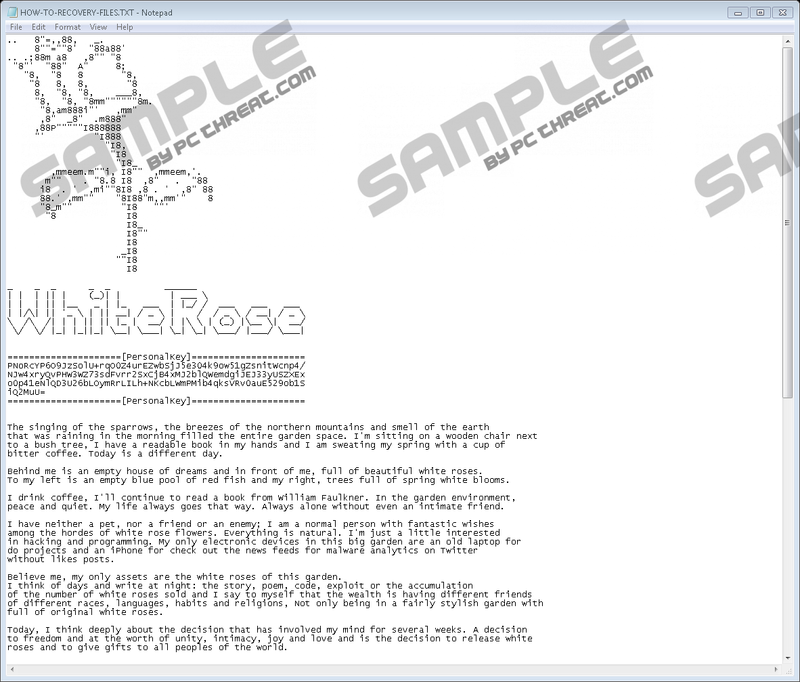 Once Whiterose Ransomware infiltrates computers successfully, it checks whether the Perfect.sys file can be found in %HOMEDRIVE%. If it does not find it there, it creates it and starts encrypting files on the affected computer right away. There are so many other harmful ransomware infections that can cause problems to you, so, please, do not leave your system unprotected. 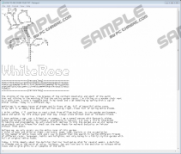 You will remove Whiterose Ransomware easily from your system, but, unfortunately, you will not decrypt your files by getting rid of this nasty infection. Luckily, you will erase this infection from your computer by removing the only file – the ransom note. You will have to find it yourself, but we are sure it will not take long to locate it. We also encourage users to scan their systems with an antimalware scanner after deleting the ransom note. You might have other active threats you know nothing about on your computer – they all need to be erased ASAP. Check all the main directories. Delete the ransom note HOW-TO-RECOVERY-FILES.txt. Quick & tested solution for Whiterose Ransomware removal.